Remember the last time you clicked on an ad, got redirected to a landing page, and had to submit a web form? Such a long, cumbersome, and unfriendly user experience. Luckily, Lead Ads were designed to disrupt this entire process. Introduced by Facebook in November 2015 and later by LinkedIn in 2017, Lead Ads offer marketers a cost-effective solution to capture more leads right within the social platform. From a user’s perspective, Lead Ads create an effortless, smooth, and mobile-first experience that makes it easier to submit personal information. Given that 72% of B2B marketers say lead generation is their most important content marketing goal, it’s unsurprising that Lead Ads are emerging as the new industry standard. 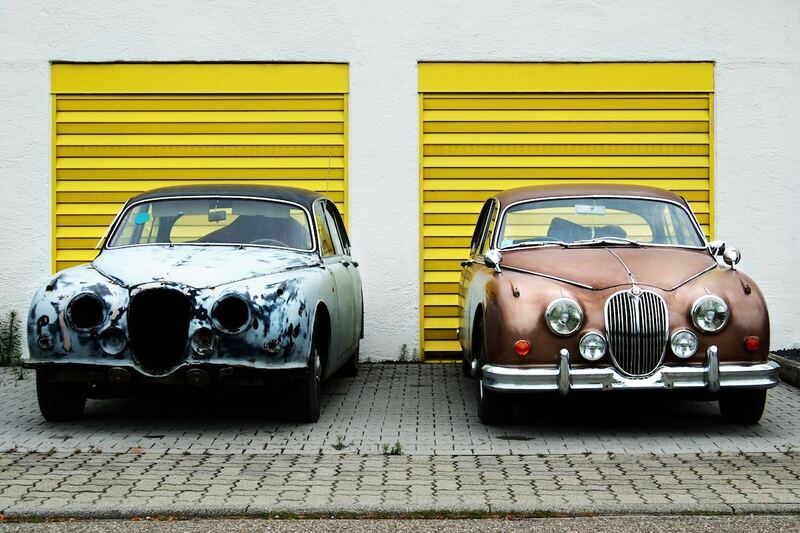 In this article, we’d like to break down how Lead Ads work and showcase 7 reasons why you should start using them over old-school landing pages. What Are Lead Ads and How Do They Work? Since the inception of Lead Ads, the landscape of B2B marketers, advertisers, and growth hackers has never been the same. Simply put, Lead Ads are a new ad format that aims to make the submission of prospect or customer data a whole lot easier. Instead of directing users to a third-party website or an external landing page, Lead Ads allow individuals to perform an in-app registration, download, or any type of call-to-action- without leaving the social network! This means that when your buyer clicks on the Facebook or LinkedIn ad, they will be immediately brought to a mostly pre-populated form that is instantaneous to complete. Not to mention, both LinkedIn and Facebook automatically pull relevant data from users’ profiles, ensuring the accuracy of that information. It’s also worth mentioning that users can easily edit the pre-populated information in case it’s invalid. As a marketer, the general user-experience of creating the form is extremely easy and quick. While LinkedIn allows you to include up to 7 informational fields, on Facebook the number of optional fields is limitless. LinkedIn Lead Ads also differ from Facebook’s in that the network caters to business professionals, making it easier for B2B marketers to capture a wealth of professional data that’s almost guaranteed to be up to date. Once you’ve selected the fields for your lead-gen form, you can also pick the call-to-action button that will appear at the bottom of the form and prompt users to take the desired action. When it comes to improving lead generation, the key is to make it easier for users to convert. Built for an in-app experience, Lead Ads not only limit the steps it takes for users to complete the form; they also limit any distraction or opportunity to abandon the process. In other words: no new tabs, no slow loading speed. All it takes is two clicks for users to convert – a significantly lower commitment compared to the standard landing page format. These days, filling out web forms on mobile makes for a slow and cumbersome user journey. It’s an even bigger problem when you consider that 40% of people abandon a website that takes more than 3 seconds to load. So it’s clear that creating a mobile-first experience is no longer a “millennial pleaser” – it’s about accommodating every single user. Who needs to manually type in their personal information when Facebook and LinkedIn can auto-fill it for you? The power of Lead Ads lies in the autocomplete feature. False contact details such as names, email addresses, and phone numbers are no longer an issue for marketers. 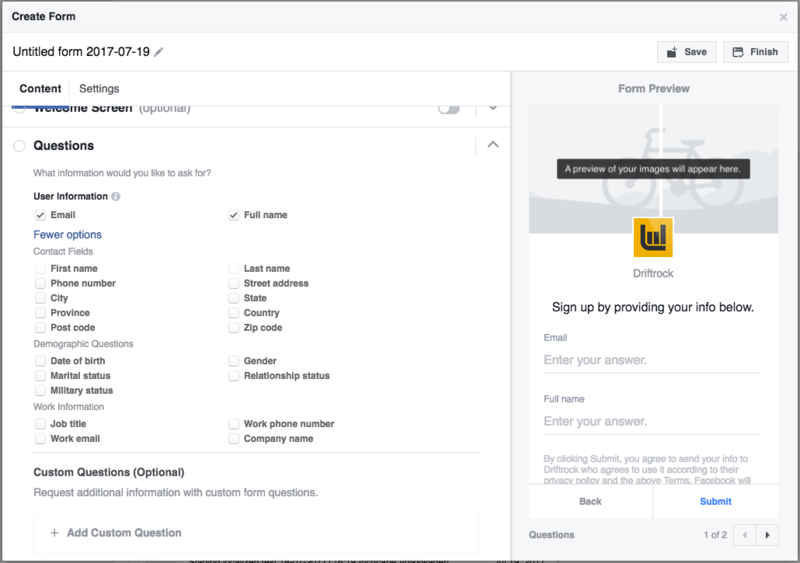 Since Facebook and LinkedIn collect the data from members’ profiles and pre-populates the form fields, marketers can relax knowing that the lead information they’re receiving is both legitimate and relevant. Unlike traditional fill-out forms, users are also not expected to manually type in their information, which means you can collect the right amount of data without hindering those conversion rates. We all live busy lives and try to disconnect when possible. I sure do. Overall, Lead Ads are a time-saving solution for marketers and buyers alike. With fewer frictions, mobile-first features, and the power of auto-fill, users can quickly click the Lead Ad and submit their information on-the-go. Marketers, on the other hand, can forget about coding or building landing pages and forms, since creating Lead Ads is a much faster and easier alternative. Something to take notice of when creating a Lead Ad is the Thank You screen. After users complete the form and hit the submit button, they’ll be greeted with a final thank you message. By this point, you’ll already have their contact information. This means that you can proceed with one of two options: write a simple thank you message OR lead people to your website or social media channels where they can receive more information. Ideally, you should leverage this opportunity to prompt a second conversion. This can come in the form of signing up to a webinar, registering to an event, following your page, or even downloading a whitepaper. As long as the follow-up action or content is in line with your prospects’ expectations and adds value to their business, they are likely to receive it with gratitude and seek more information about your brand. Needless to say, every B2B marketing strategy needs to be data-driven. This is why, in order to capture data from multiple marketing tools, a well-connected marketing stack is vital. 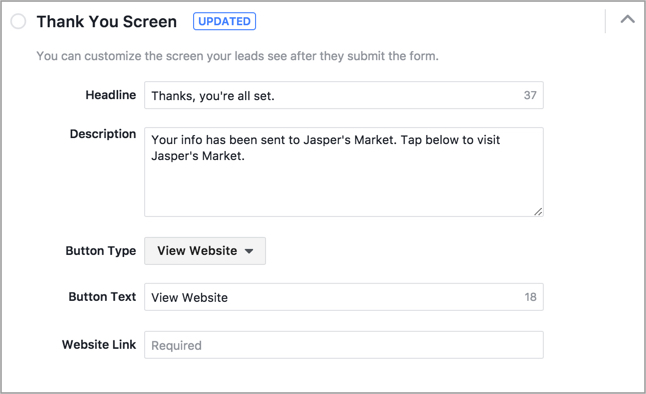 Any time a lead is captured by a Facebook or LinkedIn Lead Ad, that information automatically gets sent from the form to other tools used by your sales or marketing team. Whether you want to push a lead to your content management system, marketing automation platform or CRM, you can set up a direct integration with your preferred vendor. 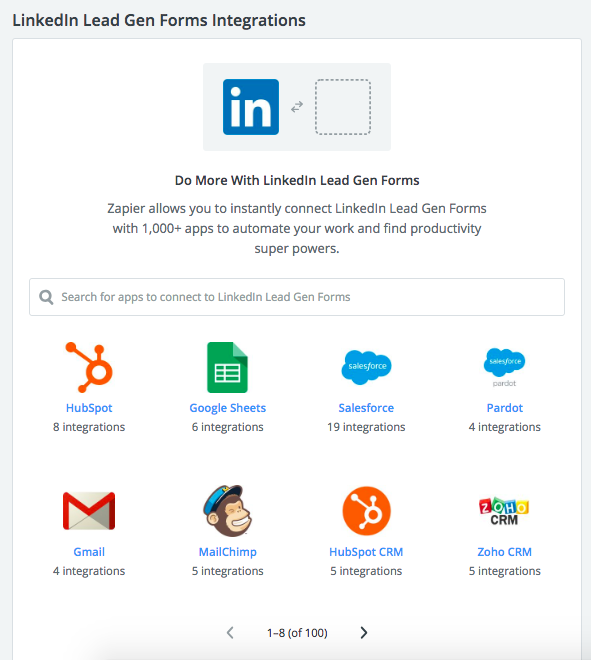 If your lead data cannot be integrated with your specific marketing automation or CRM provider, then using a tool like Zapier can make that connection available. With these various integrations comes the ability to streamline sales and marketing processes, such as enrolling leads into a nurturing flow, getting sales to qualify the leads or pick up the conversation, and even building a retargeting campaign. Looking at all of the benefits highlighted above, it’s safe to conclude that Lead Ads give B2B marketers more value for their buck. Unlike web forms and landing pages, Lead Ads bring potential customers closer to your brand without the hassle of waiting for a page to load or completing a form manually. This, coupled with Facebook and LinkedIn’s advanced audience targeting capabilities and your well-developed creatives lead to an overall better-performing campaign with higher conversion rates, lower CPL, and less work on your behalf. Sounds like the perfect lead generation strategy, am I right?